This event is supported by the Keller Center. How has this new technology created new business opportunities and shaped the way we view currency in a digital age? Will Bitcoin pave the way for a new decentralized internet? Onename is a Bitcoin-based startup backed by Y Combinator that raised $1.5 million in 2014. Onename’s digital passport that allows you to login around the web and stay in control of your identity and data. Ryan is a Princeton alumnus and was featured in Forbes’ 30 Under 30 list. Digital Currency Group is one of the most prolific investors in the Bitcoin financial space and funded a large percentage of the world’s most successful Bitcoin companies. DCG’s portfolio spans all the companies listed in Bitcoin Opportunity Corp including BitGo, BitPay, Chain, Circle, Coinbase, Onename, and Xapo. Ryan is an experienced venture capitalist, investor, entrepreneur, and journalist with an MBA from MIT and a passion for digital currency. Blockchain is the company behind the most widely used software in the Bitcoin ecosystem, including the world’s most popular Bitcoin wallet and the most popular block explorer and search engine. Blockchain currently has over 2.5 million users and raised more than $30 million in investor funding. Peter is Blockchain’s President and co-founder and enjoys history and economics. OpenBazaar is a decentralized, censorship-resistant, and open source marketplace that allows users to make trades online using Bitcoin. OpenBazaar emphasizes freedom and privacy and is currently in beta, slated for a full release in early 2015. 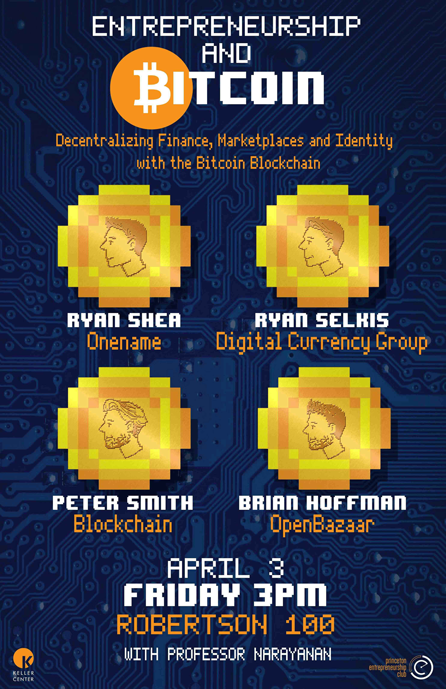 Brian is the project lead for OpenBazaar and is an experienced and passionate software entrepreneur. Our moderator is Princeton’s own Professor Arvind Narayanan, who has been featured in many publications including the New York Times and has performed a substantial amount of research regarding the technology of Bitcoin and its applications. At Princeton, Professor Narayanan teaches COS 597E: Advanced Topics in Computer Science: Bitcoin and Cryptocurrency Technologies.